I have to keep things short today. School started back for me this week and I'm going back to full time for the first time since before we moved, we're going out of town this weekend and of course, I have a 5-10 page short story due this Sunday. Woo! Let's do this. I don't usually pick up heavy topic'ed books, especially if they're realistic or nonfiction. The world is too sad sometimes, and literature is what I use to escape it, not dive farther into it. And if it involves children, nope. Count me out. There are a few heavy, slightly controversial books I have read that I'm so glad I did. These are the books that either reaffirmed my beliefs on something or completely changed my perspective on an issue. That's the beauty of books. This book is about a depressing topic told in the very least depressing way. It's about so much more than this issue, really. This is one of those "no-brainer" topics to me, but I understand how some people might think differently, so it didn't change my mind much, but it did change my heart. I love, love, love this book. This book is subtle but powerful. If you want to know what real YA is (or should be), read this book. I needed therapy after this book. I know there are people who love this kind of stuff, but this book turned me off of serious topics for a long time. However, it was a well-written, powerful novel. I just can't. This Picoult lady loves shattering hearts, doesn't she? I did love this book, but I thought that sucker punch at the end was a little harsh. Overall, the topic was interesting though. This author is obviously from Afghanistan so that is where his stories take place. I make the mistake of telling people his books are about Afghanistan, and they are, but really they are about so much more. They are about family and war and love and the ties that bind us. They are about life and death and anything and everything that a book set in America is about. So, while I think he receives a lot of attention as the Afghan writer, he deserves recognition for just being an amazing writer, no matter where he is from or where his books are set. Read these books!! So, I noticed that a lot of my heavy books overlapped with my school-assigned reading. I think it's mostly because I don't read these heavy reads unless it's for a grade. Did that happen to anyone else? Share your favorite heavy-topic or controversial books. Please go read today's post from our co-host, Erinn of It's the Journey. She's got something good in store for us today. As always. While you're there, add her to your Reader and show some love. 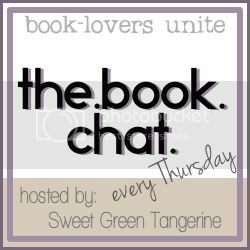 Next week's topic: Share your favorite book cover designs! The Pact gave me nightmares. Like wake up crying in the middle of the night, nightmares. TJ said I wasn't allowed to read it after dinner. And you're right, it was well written, and when people asked me if it was good I said, "Yes, but I wouldn't recommend it to anyone." My mom didn't understand so I had to explain about my nightmares. It was weird. A book hasn't done that to me since, and I'm ok with that. I have not read any of these except the Kite Runner, which completely destroyed me. I think I tend to shy away from some of the serious books, life tends to be serious enough and I look to reading for more of an escape from that. I love Khaled Hosseini! Great writer. I really like A Thousand Splendid Suns but I loved The Kite Runner. The Kite Runner and A Thousand Splendid Suns are books that I recommend to EVERYONE. They are amazing books! I've read A Thousand Splendid Suns but haven't checked out any of Khaled's other books because that one was just HARD. Wonderful, but hard. It's one of my favorite books now, but it was a Journey to get through. (I totally also named my car Laila after the character. Haha.) I need to read The Kite Runner, though, soon!! I'm definitely a light and fluffy reader. I don't read too many hard or controversial books because they just hurt my heart and I read for an escape, not for heartbreak! But those also tend to be some of my favorite books, too. I love Jodi Picoult but I'm pretty sure I also needed therapy after reading The Pact - and I really, really need to get around to reading Khaled's books! I tend to stay away from the tough issues books (big surprise!) and almost all of the ones I have read had to do with school reading too. I've read only one Jodi Picoult book and that was enough for me. She is a wonderful writer but way too sad for me. Kite Runner was very close to making my list but I wasn't sure how "controversial" it was compared to some others I've read. Everything by Jodi Picoult deserves a spot on this kind of list. She's awesome. I need to read Jojo Moyes!